Injera is an important part of this shared meal. Bread is more than just a food. Just think of how the word is used: A persons bread and butter is his or her main source of sustenance, while bread or dough can be cash, plain and simple. When people break bread they share more than just a meal: They come together in body as well as spirit. Its not surprising that bread is imbued with special meaning. Since the first raised breads were baked in Egypt around 4,000 B.C., bread has been a vital food source for peoples around the globe. Over the centuries it has traveled and evolved, reflecting both the unity and diversity of human culture, and the ability of people to adapt to their environment. On this site, we talk mainly about the science behind the tall, tender loaves that most people are familiar with in the West. But bread comes in countless forms, from the plump bagels of New York City to the paper-thin nane silli eaten by Kurds. 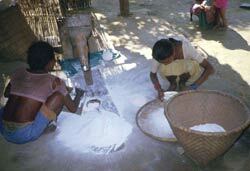 Women prepare flour in Nepal. What kind of bread people make depends on what kind of grain is available, and that often depends on local climate and geography. In Ethiopia, for example, the nutritious, high-protein grain teff, which grows well in the countrys central highlands, is used to make injera, the sour, spongy bread eaten with most meals. Barley, on the other hand, well-suited for cold climates, is used in Finland to make ohrarieska, a traditional staple and after-sauna snack. The Bible tells of the matzoh the Israelites ate as they fled Egypt. Because the former slaves dough had no time to rise, it baked on their backs as they escaped into the desert. Whether or not the story is historically accurate, we do know that lifestyle plays a major role in the kinds of breads people eat. In central Asia, where both grain and fuel are scarce, nomads make small, thin rounds that cook quickly over a fire. To survive long, cold winters, the people of central Anatolia hang rings of bread from the rafters. When fresh bread is needed, a ring is brought down, moistened with water, and soon is ready to eat. Whatever kind of bread youre used to, a little bit of science can make you a better baker, and also make your time in the kitchen more fun. To find out more, check out these links.